On Saturday, famed fashion photographer Bill Cunningham died at the age of 87. Cunningham's work is probably well known to any readers of The New York Times, where he worked for nearly four decades, building a towering reputation as he cataloged the myriad, ever-changing styles of the streets of New York City. Many people have offered tributes since hearing the news, and in that spirit, why not look back some of the man's work? Here's the last photo set Bill Cunningham ever took for The New York Times, aptly titled "Duality." Cunningham reportedly passed away in New York on Saturday after suffering a stroke, bringing his legendary life and career to an end. He was still hitting the streets and snapping photos right up towards the end of his life, however ― his last New York Times column and photo set ran on June 3rd, 2016, just 22 days prior to his death, and it's a good one. Duality is a striking set of black-and-white, on-the-street styles, and there's a video showing them off too, narrated by Cunningham himself. There are some undeniably gorgeous looks in there, all the more beautiful for the crisp contrasts they strike. Here's how he put it in his accompanying column. The contrast between black and white is a favorite, no matter the generation. It showed up in bold graphics and in romantic 1950s silhouettes and prints as the young crowd offered its interpretation of the combination. If you somehow landed your apparent dream job, and got to keep it for as many years as Cunningham did, you'd probably be barely able to understand your good fortune ― the Times first ran some of his photos back in 1978, and he remained a well-known fixture of the New York scene for the next 38 years. One of the unique things about the way Cunningham interacted with the public, as well, is that he left a lot of people who've never even met before ― across different social strata, in particular ― with shared memories, of what it was like to be photogrpahed by him. 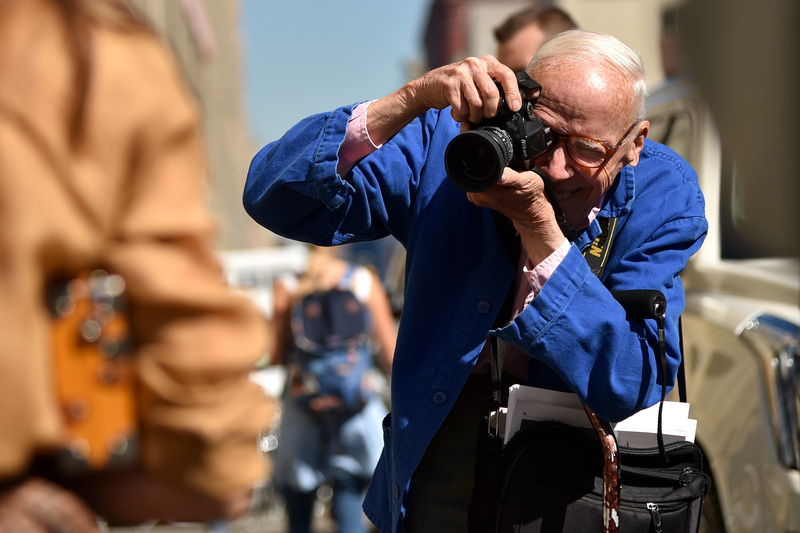 Memories that are as true for towering icons of the world of fashion as they are for the everyday New Yorkers he snapped while roaming the city's sidewalks. There simply aren't very many people out there who can say they've had such prolific, iconic careers. It's no overstatement to say that Cunningham's death marks the end of an epoch in the photographic history of New York City, a place seemingly tailor-made for evocative imagery. Hopefully someone from the current generation will someday be able to fill that void, but for now, we probably shouldn't hold our breaths.